Let's face it, we barbecue and grilling folk are all about the tools and gadgets. We'll try almost anything that we think will improve our results. Because many gadgets are disappointing we also tend to be a skeptical bunch. So, when you hear a consistent and nearly unanimous consensus about a given tool or gadget, it speaks volumes. The Thermapen from ThermoWorks clearly falls into that category. I'll be honest and say that, although I've heard many of the cooks I respect preach the virtues of the Thermapen for years, I've only recently tried one because the great folks at ThermoWorks asked me to take it for a spin. Until now I've been content with spending $10 - $30 on all manner of thermometer, only to be disappointed and start over. Now I know what I've been missing. 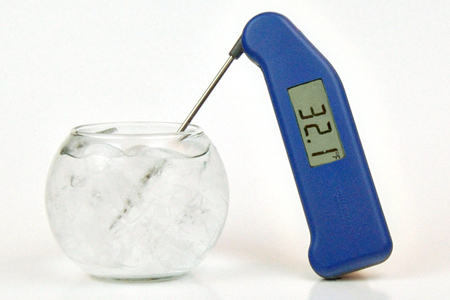 I think that there are relatively few things that cooks look for in a good thermometer. We want accuracy, a quick read, ease-of-use, and dependability. When I pull out a thermometer I want to know that I'll get consistent accurate readings with no hassle. I don't want to wonder if the thing is lying to me. This is especially true in competition barbecue where you've got hundreds, if not thousands, of dollars on the line with very little margin for error. I've had my Thermapen for a few weeks and it is an absolute dream come true. The thing is dead-accurate and reads in three seconds with pinpoint precision, thanks to its narrow tapered probe. I did a side-by-side test with boiling water and ice water and I was simply amazed at how fast it reads. Gone are the days of standing with my hand over a hot fire waiting for El-cheapo thermometer to tell me if my food is done. Check out the specs on this bad boy! If, like me, you're tired of being like a rat on a wheel dealing with cheap thermometers, do yourself a huge favor and spring for one of these. Yes, I know, they seem spendy on the surface, but I guarantee that you'll never regret the decision. It really is as good as you've probably heard. Likewise, if you have a cook in your life and you want a great gift idea, look no further. You'll be a hero to them for a long time to come. Disclaimer: ThermoWorks provided me the Thermapen™ free for the purpose of this review, but the thoughts expressed are my own, and I stand by them. I have the original non-splash proof version and it rocks. I just wish I had waited because the splash proof version came out weeks after I bought mine. Good news is that I've managed to keep it from splashes. ThermaPen's are GREAT...I love mine! Buy the best and only cry ONCE!! I wish someone would send me a free Thermapen. (grin) I've read great things about this therm for a while. It's on my "wish list" for Christmas. Good write up!! New must-have for my husband. Thanks.